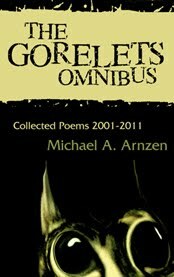 The Gorelets Omnibus is a "collected works" volume of all my twisted horror poems from gorelets.com and elsewhere over the past decade. I'm proud of the book, which includes not only hundreds of pages of short-short horror poetry (reminiscent of the flash fiction from another of my Raw Dog books, 100 Jolts), but also -- available only in the special hardcover edition -- a variety of miscellaneous pieces that should inspire anyone who is interested in writing dark fiction or adding a little strangeness to their work. For instance, there are five articles written by scholars from America and the UK, analyzing what makes the poems tick and what makes today's "new media" horror special. There is also a collection of "how to" articles on the crafting of horror poetry that I've published over the years. And -- perhaps best of all for the creative writers reading this -- this book includes the entire collection of my "Instigation" prompts from over the past ten years (including the impossible to find Instigation columns from Hellnotes magazine from years ago). Go check it out at Raw Dog Screaming Press and sign up for my newsletter on gorelets.com for insight into what this book has to offer. Over the past two decades, Michael A. Arnzen has won five Bram Stoker Awards for his avant horror fiction, his quirky dark poetry and his bizarro antics online at gorelets.com. His other titles from Raw Dog Screaming Press include a novel (Play Dead), a collection of flash fiction (100 Jolts: Shockingly Short Stories), a CD of musically-enhanced readings (Audiovile) and, forthcoming, a scholarly study of dread in pop culture (The Popular Uncanny). When he's not writing, Arnzen wears the mask of professor of English at Seton Hill University, home of the country's only MFA degree in Writing Popular Fiction. Get gored again and again at gorelets.com or join his social network at michaelarnzen.com. What a treasure of your work over the years, Mike! The book itself is beautiful. Thanks for hosting RDSP week! Love all these articles.